Hinoki blades are quite different from other blades. Each blade has a particular visual, even if it is the same brand and model. I like quiet a lot to see pictures of Hinoki blades, there is something on it that is attractive to me, and I believe that are many more users here that also admires the beautness of these works of art. I'm creating this thread so you can post pictures of your hinoki / cypress / WRC / POC / etc. single ply blade. There were a few threads about it on the past. Some pictures do not work anymore and also the OPs doesn't seem to access this forum anymore. So I will try to make a new (and maybe definitive) thread about this subject! I will try to make backups of pictures from time to time (maybe once a month? ), so we don't loose these already rare to see blades! The other strong reason to start a new one instead of reviving an old thread is because I believe this way people would be more willing post participate. With these 4 pictures, all grains details are covered! But if you want to just take one overall picture, no problems too! "ATTENTION! ALL SINGLE PLY HINOKI CLUB MEMBERS"
"PICTURES OF YOUR 1PLY HINOKI JPENS"
I will also ask for help to indicate good, free and reliable websites to host the pictures. I only know imgur. 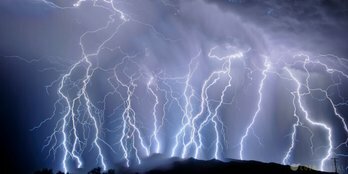 I think it is possible to attach pictures on your post directly from your PC/smartphone using forum tools, but I don't know exactly how it works. I tried to use once but it didn't work very well, but we can try this again too. (there is also an option there to set maximum size. If you want to attach a pic via forum tool "insert image", then you can set this at 200 kb, since this is the forum limit). Usually I put 75% smaller (depends on your cam resolution) and 200 kb. Thanks for starting this. I’ll post pics of my 2 Darker 1-ply this weekend. Here are 2 I have from BBC, they are dark WRC. The first is 9.5mm, second is 9mm. They weigh 100g and 97g respectively. The 9.5mm one has been split and repaired. I couldn't get a good edge picture due to their dark colour. Here is another WRC from BBC. It is 10mm, 97g. It has been split once and repaired. Here is a homemade WRC racket. It is 10.5mm and 104g. It was my first attempt, hence the utilitarian, no aesthetics look. It has also been split and repaired. This is my second homemade blade, made of WRC. It is also my main blade. It is 11.5mm and weighs 109g. All of these blades have been sanded with 2000 grit sandpaper except the dark 9mm one. The orange tint in some areas is the sealant I used after repairing the split or making the blade. Some parts are more orange than others because the blade was either slightly uneven, or because it was in an area that needed extra sealing. Sure, you can post pictures of your LS too! Wow, I didn`t know you were a blade maker! What have you used to repair your split blades? I used regular wood glue once and it seemed to have worked well, but I don`t know if there are other better alternatives. I liked your anatomic-to-fingers handle, very different! Wood glue seems the best. The first time I repaired one, I used epoxy. It was weaker and didn't bond the wood together as well, and the split was very visible. This is the BBC 10mm one. For the others, I used wood glue. The first blade I made split right next to the handle, so it was not a clean split. However, the wood glue fixed it pretty well. The split is only really noticeable at the handle now. And I can't even find the split anymore on the dark 9.5mm one. Oh one more question: what product do you use to seal your hinoki blades? And do you know if 1 ply hinoki are prone to splintering just like regular multiply blades? I'm asking this because I've read some discussions on the past here at mytt and some people said that 1 plies doesn't need sealing, others said the it was better to have, and others said that it could change the hinoki feel etc...a lot of controversial infos/experiences. The 1-ply blades are not really prone to splintering on the face, but it has happened before. They do sometimes splinter at the edges, close to the 'eye' because the layers of wood there are very thin and separated by grain. However, this takes more than sealing to fix. I usually put some superglue in that spot to prevent splintering. I seal my blades mainly because I want to keep moisture out, not because of splinters. I have used them unsealed, and have not noticed a difference. To seal, I use shellac. It is a type of wax dissolved in ever clear. I use a lint free cloth to rub it on the blade in an even layer, and then let it dry for 20 minutes or so. Then, I sand it down on a glass plate with a very fine paper as far as I can before breaking through the layer. This makes the surface even, even if the layer of wax is not (I have not yet mastered the planer). It does add noticeable weight, but I prefer heavy blades anyway. To test if it is sealed, I put a few drops of water on the blade and see if it slides around without getting absorbed. Thanks very much for the infos! Indeed, the side edges are more fragile, when I took a sidetape off it had some very small spinters. Another solution to this is to put an epoxy layer along all the edge. 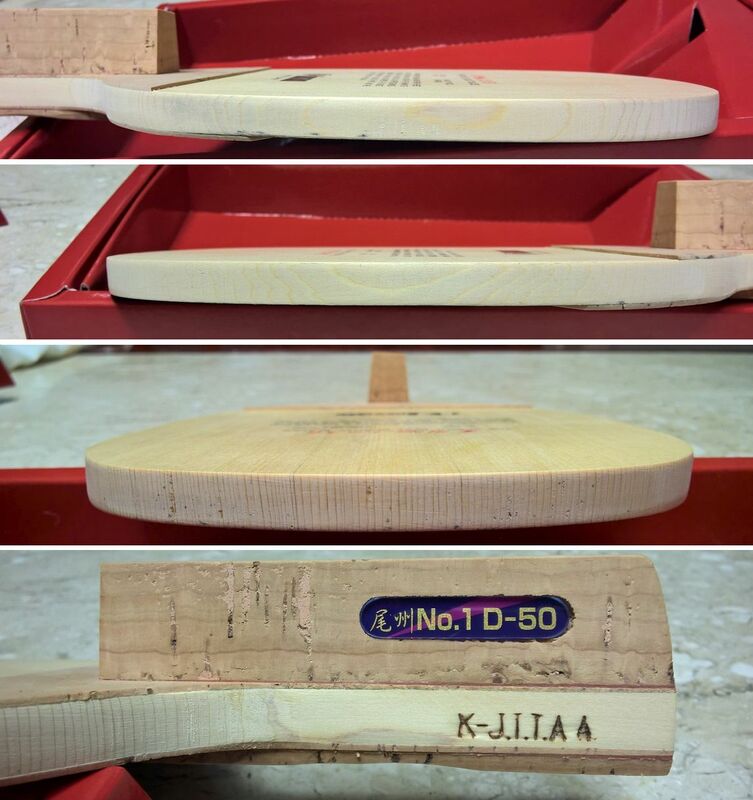 I learned this from Kevin (American Hinoki), he recommends it to protect blades from splintering from hits/drops, but it can also protect from these side splintering too. So one is a speed 90 for sure (ST handle, 90.5g) while my main blade does not say so but it plays the exact same and the eyes are better. Your main blade is particularly beautiful. Perfect eyes, vertical and uniform grains! My American Hinoki WRC-9mm. The last part shows the edge with epoxy applied. And are you left handed? Your blade has an unusual cutout on the left side. Your Kokutaku actually has rather nice grain in that they are quite even. The manufacture quality is not quite as high given the visual defects and filling of the pits in the cork. 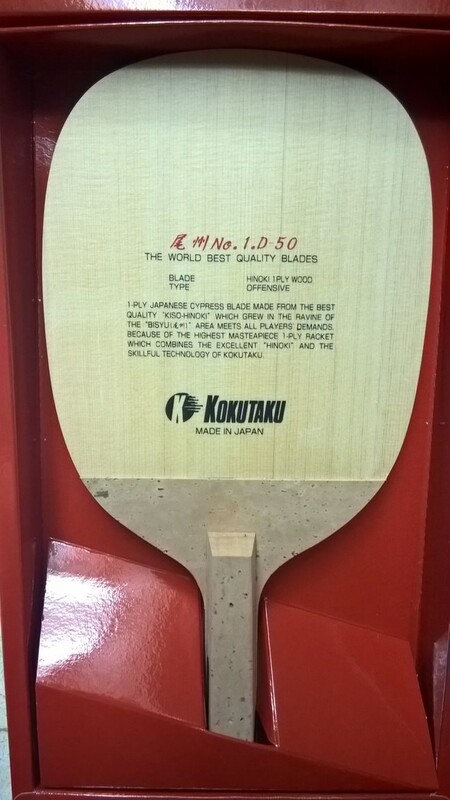 Cork quality is low but the hinoki itself looks rather nice - though there seem to be 'pits' in the blade top edge. 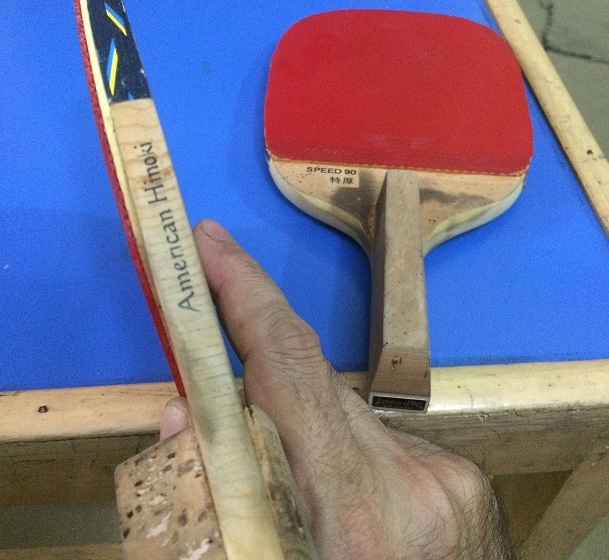 American Hinoki (Kevin) is an american custom blade maker. His website is offline since more than a year ago, but he is still making blades if you email him. If you want to order a blade from him, I can pass to you his email. The wood used on the blade above is Western Red Cedar, which according to some reviews, plays quite similar to some best Kiso Hinoki blades out there. 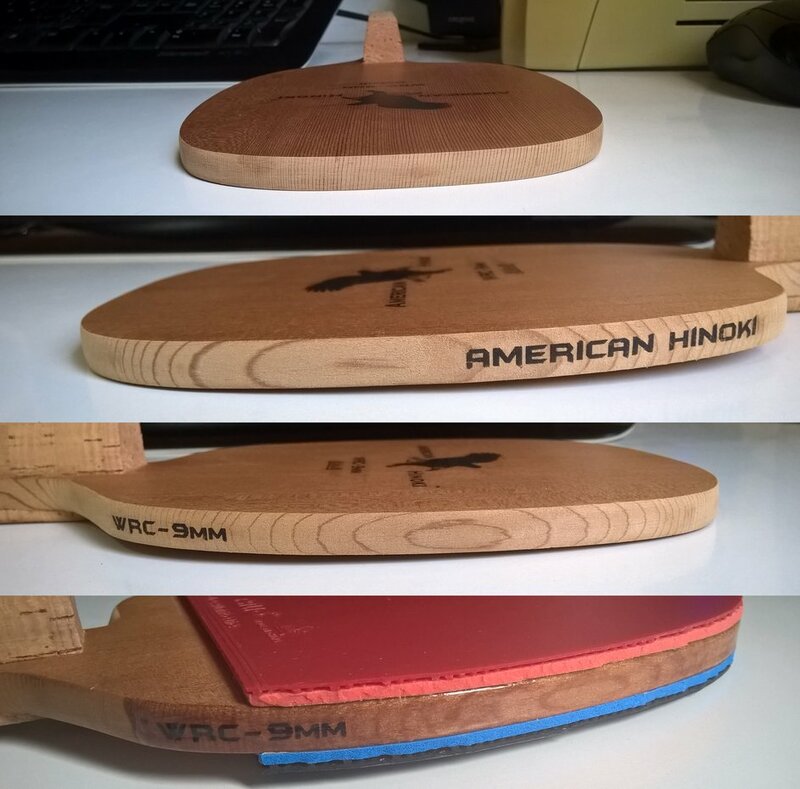 JimT wrote some reviews in the past about American Hinoki WRC and BBC (Blades by Charlie) single ply WRC. Yes I'm left handed. 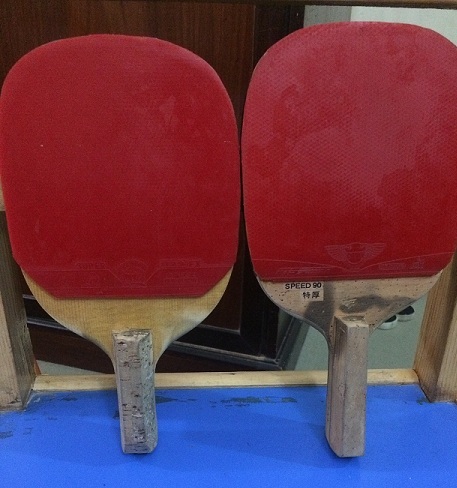 This blade shape was made to facilitate RPB. Interesting observation about the cork. Actually I've never paid attention to the cork quality, I will pay more attention to it from now on, thanks! The D50 is Kokutaku 2nd cheapest single ply, so that makes sense. MTMT, your are more than welcome to post pictures of your equipment/hinoki boards here too if you want . 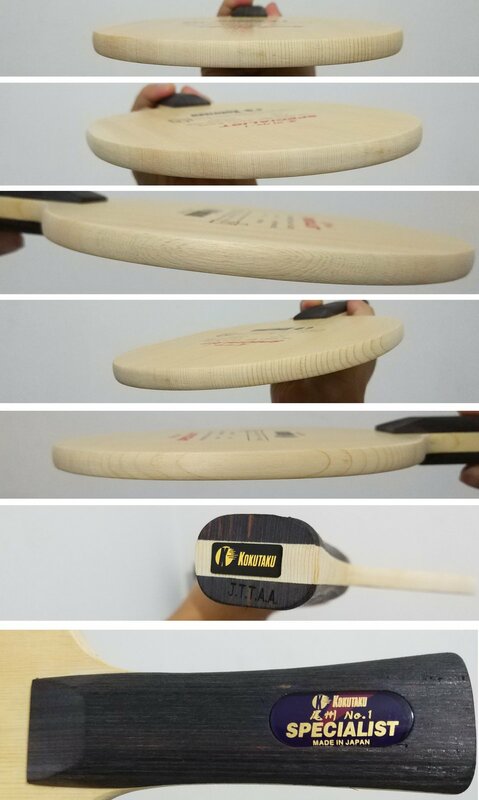 You can also post some informations about hinoki quality and characteristics when selecting a blade, you have great knowledge about it, it would be awesome if you could share it with us. Or you can post it on your thread if you prefer, no problem too, and I can post a link to it on my second post. Ok so I took pics of my AHinoki as well as my Darker Blade. Unfortunately both have rubbers and edge tape on them. I am out of edge tape right now and I am really careful with all my TT stuff. I will post pics without the edge tape too but soon as I go out and get some so I can replace it immediately. With the A Hinoki I had two pics that Kevin had sent me to show me how the blade looked before he shipped so I added those in as well. I had him engrave my initials on it too. Your Lutz Spruce blade is very nice Ranger-man! It is the first time I see this wood type. Is it similar to hinoki in playability? You have some amazing blades Shinshiro. The Kokotaku Bishu is beautiful and the grains are so tight! The workmanship is way better than on the Jpen Kokutaku. That shakehand has to play like a dream. Do you play both shake and penhold? Because you have a Jpen Kokutaku and then that WRC Ahinoki which is a stunner. I that pile of blades on imgur yours? Because man, I am drooling. I do have to say Kevin makes gorgeous blades. I love how his wood is perfectly quarter sawn, which not every blade maker is that vigilant about. I am actually thinking of getting another one from him. I am also thinking of buying another Speed 90 from iruiru as a backup blade. 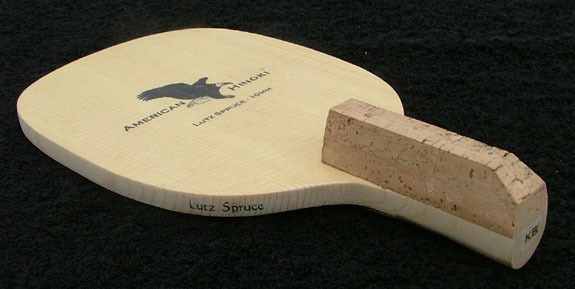 The Lutz Spruce plays very well. It would be a great replacement for someone who wants the type of game that only a one-ply Hinoki blade can give but does not want to spend that much. I would not say exactly the same, but similar. The differences don't make it worse, just different. It loops well, has a nice soft touch and great control and power when needed. It has a lot of gears too and can keep upwith the Hinoki on the higher end of the spectrum (power) but the Hinoki beats it in the soft touch realm. It is one of my favorite blades for sure. How does the WRC Jpen play Shinshiro. In what ways is it different from a one-ply Hinoki blade? I am very curious because I keep thinking about asking Kevin to make me one. Chairman Meow, I am thinking about making a one-ply blade so I will definitely pester you with some questions when I get down to it. That is one monster of a blade though, the 109gm WRC. I played j-penhold for a few months, but I couldn't addapt to TBP. I also tried RPB for a short time too (my American Hinoki blade was designed for that). I could use RPB quite fine, but was having some finger/wrist pain, so I decide to stop and play shakehand again. I want to try to play jpen again in a near future. My WRC Jpen was a bit different than usual because I asked Kevin to make it as light as possible, and it came out having only 64g (!!!). Therefore is was not very fast like usually a 1 ply is. It was definetely slower than the kokutaku D40 (84g). I used different rubbers on each and it's been some time since I last played then, so I'm afraid I'm not able to give more in deep details (and I'm also a low level player, which doesn't help too LOL). But I've read some reviews here at mytt, and if my memory is right, JimT used to play with a WRC blade (from Kevin and Charlie also), and he said that it plays almost indistinguible from Darker Speed 90. Another guy said it was only a bit slower than Speed 90. From the reviews I read in the past, I believe WRC 1ply is the closest you can get to Kiso Hinoki in playability (but it is also true that there aren't many reviews from other woods, like Lutz Spruce, POC, etc. I would like to know how close POC is to hinoki when playing, since on theory this is the closest one). I also read from more than one source that WRC is a bit softer than Hinoki. Have anyone had the oportunity to play with 1 ply blades of different hardness? I know that hardness can vary even on same hinoki type. 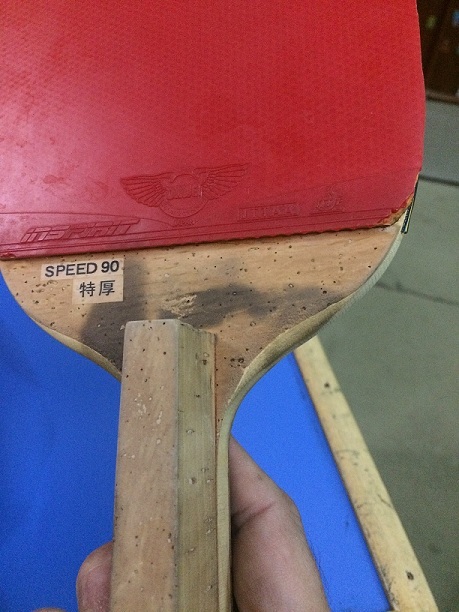 On rubbers, it seems that generally the softer ones have more catapult (less linear) on soft touches, but don't have the top speed the hard rubbers have. This reasoning also applies to blade 1 ply blade hardness? I may buy a blade soon, but I would like to know more about this characteristic first. Shinshiro, how does the Kokutaku Bishu no1 Specialist play? Can you do a short review on it? ie: speed, control, feel, hardness, etc. The KKT Specialist is on the soft side, feels softer than my 5 ply blades in general. Feels very stable on blocking and hitting, can generate a very good speed. 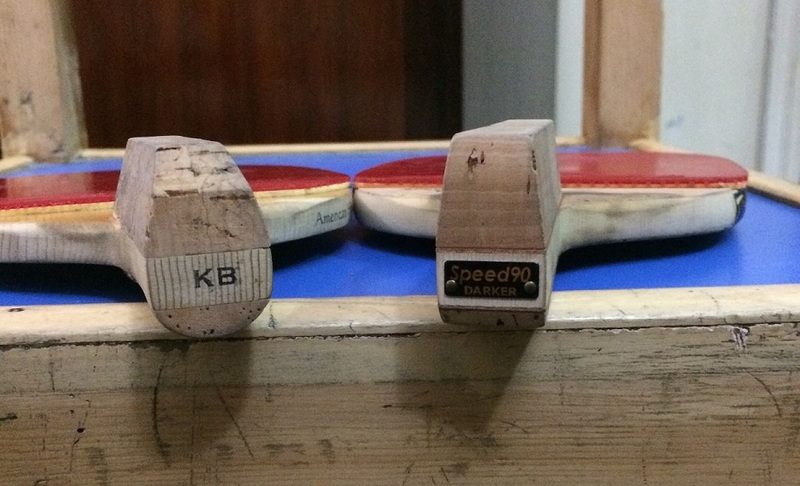 I had some trouble on lifting backspin balls, much more shots were going into the net than with 5 ply blade I was using before (tought I'm not 100% shure if it's due to blade or if I was just on a bad day). It is not much, but I hope it can help you. I'm not a very good reviewer, and I'm also a beginner so take that with a pinch of salt. Ahh, keeping the 1-plies alive! Well, my Nittaku Miyabi R has been sold to MTMT. 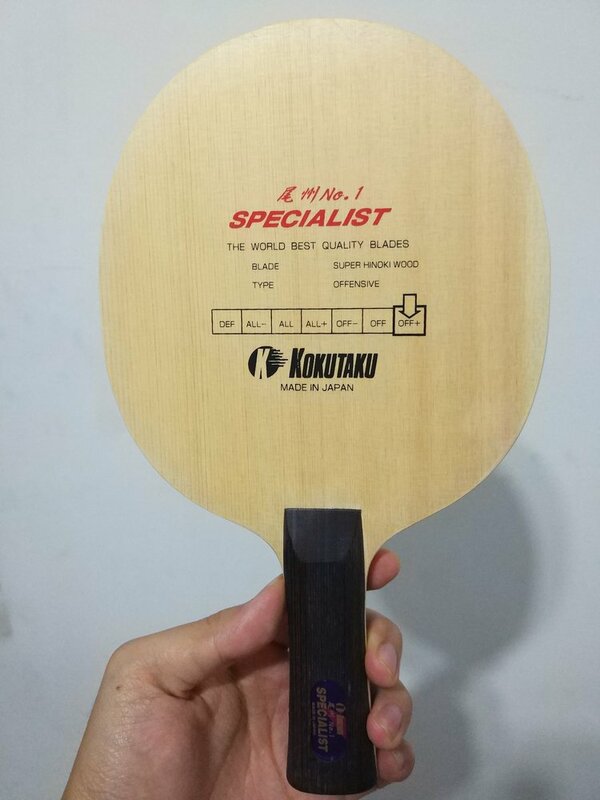 shinshiro，can you measure the dimensions(thickness x width x length) in mm of the shake hand Bishu No.1 Specialist blade? Thanks.